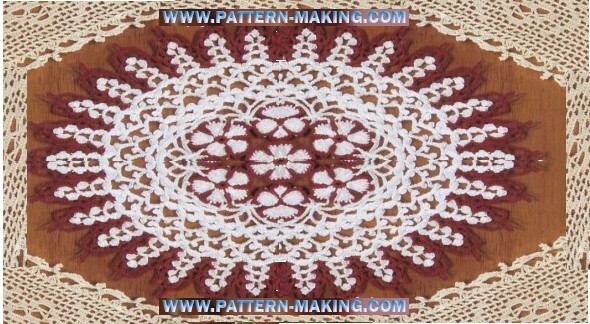 xperience Level Advanced Size 14 inches in diameter Materials South Maid crochet cotton size 10: 1 ball No 496 cardinal 1 ball No 1 white Steel crochet hook size 7 Gauge Flower = 1% inches in diameter Pattern Notes Weave in loose ends as work progresses. Double treble (dtr): Yo hook 3 times, insert hook in indicated st, yo, draw up a lp, [yo, draw through 2 Ips on hook] 4 times. Flower Center Center flower Rnd 1: With cardinal cotton, ch 7, join to form a ring, ch I, work 12 sc in ring, sl st to join in beg sc, draw up a lp, remove hook, do not fasten off. Rnd 2: Attach white cotton in first sc, “ch 4, 3 dtr in same st, 3 dtrin next st, ch 4, sl st in same st, sl st in next st, rep from ;, around, fasten off. Rnd 3: Pick up dropped lp of cardinal cotton, ch 5,. sc in next 6 dtr of first petal, ch 5, sl st into Rnd 1 between petals, *ch 5, sc in next 6 dtr of next petal, ch 5, 51 st in Rnd I between petals, rep from * around, fasten off. Second flower Rnds I & 2: Rep Rnds 1 and 2 of center flower. Rnd 3: Pick up dropped Ip of cardinal cotton, ch 5, sc in next 3 dtr of first petal, ch I, sl st in center dtr of any petal of center flower, ch 1, 51 st in same st on 2nd flower, sc in each of next 3 dtr, ch 5, sl st in Rnd 1 between petals, *ch 5, sc in next 6 dtr of next petal, ch 5, 51 st in Rnd I between petals, rep from” around, faste n off. Third flower Rnd s 1 & 2: Rep Rnd s 1 and 2 of center flower. Rnd 3: Pick up dropped lp of cardinal cotton, ch 5, sc in next 3 dtr of first petal, ch 1, join with 51 st in center of first free petal on right-hand sidc of 2nd flower, ch 1, sl st in same st of 3rd flower, sc in next 3 dtr of same petal of 3rd flower, ch5, 51 st in Rnd 1 between petals, ch 5, sc in first 3 dtr of next petal, ch 1, join with 51 st in center of next petal to the left on center flower, ch I, sl st in same st on 3rd flower, sc in next 3 dtr of same petal of 3rd flower, ch 5, sl st in Rnd 1 between petals, “ch 5, sc in next 6 dtr on next petal of 3rd flower, ch 5, 51 st in Rnd 1 between petals, rep from * around, fasten off. Fourth-sixth flowers Work as for 3rd flower, joining each new flower to previous flower and cen¬ter flower. Seventh flower Rnd s 1 & 2: Rep Rnds 1 and 2 of center flower. Rnd 3: Pick up dropped lp of cardinal cotton, ch 5, sc in next 3 dtr of first petal, ch 1, join with 51 st in center dtr of first free petal on the right hand sidc of 6th flower, ch 1,51 st in same st of 7th flower, sc in next 3 dtr of same petal of 7th flower, ch 5, sl st in Rnd 1 between petals, ch 5, sc in first S dtr of next petal, ch 1, join with 51 st in center dtr of last free petal of first flower, ch 1, sl st in same st of 7th flower, sc in next 3 dtr of same petal of 7th flower, ch 5, sl st in Rnd 1 between petals, ch 5, sc in each of next 3 dtr of next petal, ch 1, join with sl st in center dtr of next petal to the left on 2nd flower, ch 1, sl st in same st of 7th flower, sc in next 3 dtr of same petal of 7th flower, ch 5, sl st in Rnd 1 between petals, *ch 5, sc in next 6 dtr of next petal of 7th flower, ch 5, sl st in Rnd 1 between petals, rep from * around, fasten off. . Doily Rnd 1: Attach white cotton in 2nd sc of first free petal of any flower, ch 1, sc in same st as joining, *ch 6, sk 2 sc, sc in next st, ch 6, sc in 2nd sc of next petal of same flower, ch 6, sk 2 sc, sc in next SC, ch 6, yo hook twice, insert hook in ch-S on sidc of next petal, draw thread through, [work off 2 Ips] twice, yo twice, insert hook in joining between flowers, draw thread through, [work off 2 Ips] twice, yo hook twice, insert hook in ch-f lp in sidc of joining petal of next flower, draw thread through, [work off 2 Ips] twice, yo and draw through rem 4 Ips on hook (cluster between flowers), ch 6, sc in 2nd sc of next petal, rep from * around, ending with ch 6, join in beg sc, do not turn. Rnd 2: SI st in first lp, ch 1, sc in same Ip, *[ch 7, sc in next lpl twice, ch 7, tr in center of cluster between f1owers,ch 7, tr in same sp, ch 7, sk next lp, sc in next lp, rep from” around, ending ch 7, join in beg sc, Rnd 3: Sl st to center of first lp, ch I, sc in same lp, *work a double rice st as follows: [ch 4, keeping last Ip of each dc on hook, 2 dc in 4th ch from hook, yo and draw through 3 Ips at once] twice, sc in next lp, rep from * around, ending with double rice st, join in beg sc. Rnd 4: 81 st to center of double rice st, ch 1, sc in same place, *work a double rice st, sc in center of next double rice st, rep from * around, ending with double rice st, join in beg sc. Rnd 5: SI st to center of first double rice st, ch 1, sc in same place, *[ch 7, sl st in 4th ch from hook] twice, ch 3 (double picot lp made), sc in center of next double rice st, rep from * around, join in beg sc, Rnd 6: 51 st between picots of first lp, eh 1, sc in same place, “[ch 7, sl st in 4th eh from hook] twice, eh 3, se between picots of next lp, rep from * around, join in beg sc, Rnd 7 SI st between picots of first Ip, eh 1,. sc in same place, *[eh 4,2 dc in 4th eh from hook keeping last lp of each dc on hook; yo, draw through all Ips at once for a single rice st] 6 times, dc between 3rd and 4th rice sts, work single rice st, tr between 2nd and 3rd rice sis, work single rice st, between first and 2nd rice sts work 3 tr keeping last Ip of each tr on hook, yo and draw through all Ips at once (cluster st made), work single rice st, sc between picots of next Ip, rep from * around, join in beg sc, fasten off. Rnd 8: Attach cardinal between 4th and 5th dce sts of any finger, eh 1, sc in same place as joining, *eh 9, sc between next 2 rice sts, ch 7, sc in dc between next 2 rice sts, ch 7, sc in tr between next 2 rice sts, ch 3, yo hook, insert in cluster st between next 2 rice sts, draw thread through and work off 2 Ips, yo hook, sk next rice st, insert in cluster between first and 2nd rice sts of next finger, draw through and work off 2 Ips, yo and draw through all 3 Ips on hook, eh 3, working up next finger, se in tr between next 2 rice sts, eh 7, sc in dc between next 2 rice sts, ch 7, sc between next 2 rice sts, rep from * around, ending eh 7, join in beg se. Rnd 9: SI st to center of next lp, eh 1, sc in same lp, *ch 7, sc in same lp, eh 7,. sc in next lp, ch 3, yo hook, insert In next [p, draw thread through and work off 2 Ips, yo hook, insert in next ch- 7 lp on sidc of next finger, draw thread through and work off 2 Ips, yo hook and draw through all 3 Ips on hook, eh 3,. se in next lp, eh 7, sc in next Ip, rep from * around, ending with eh 7, join in beg sc, fasten off. 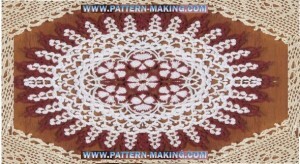 Starch and press doily.